Here are two more clips from Cheech & Chong's live tour DVD/Blu-ray, Hey Watch This. It's being released April 20th. New York, NY, April 15, 2010 --(PR.com)-- "Cheech & Chong's Hey Watch This" marks a media first: The maiden voyage of a trendsetting new release/distribution model; making the film available simultaneously on every platform including nationwide movie theaters, DVD/Blu-Ray, online, local retail outlets, VOD and PS3 / Xbox360 streaming networks. All fittingly released on April 20th (4/20). The movie showcases comedy legends Cheech Marin and Tommy Chong during their highly successful reunion tour: Cheech & Chong Light Up America. This no holds barred film captures the essence of their return featuring the blowout San Antonio concert complete with back stage antics and brand new material. It’s the greatest hits of everything fans love about Cheech & Chong. It’s not just another concert movie. "Hey Watch This," a visionary stand-up film helmed by comedy and documentary director Christian Charles (Jerry Seinfeld’s "Comedian"), was painstakingly constructed with the pot-loving, laid back fans in mind. The tour saw the legendary pair together for the first time in over 25 years, selling out more than 100 shows to become one of the most successful comedy acts of 2008-2009. The film is produced by mouseROAR and Anonymous Content for The Weinstein Company. mouseROAR llc is a boutique "soup to nuts" content provider specializing in unique entertainment for internet, television, film and mobile devices. "We're also ready for when they come up with a system that projects stuff right into your head." Cheech was in New York City today promoting Cheech & Chong's live tour DVD/Blu-ray, Hey Watch This. It's being released April 20th. We've dropped the price on Cheech Marin and Friends. If you are interested in checking out the new W Hotel at Hollywood and Vine in Hollywood, California a fine opportunity presents itself with the Eighth Annual Wine Aficionado Dinner benefiting the Bogart Pediatric Cancer Research Program. The event will take place on Thursday, May 13th. Tickets for this year's dinner "Hollywood and Wine: The Biggest Stars in Wine Today" are $1,250 per person or $10,000 per table of ten. Attendees also have the opportunity to be among the first to stay at the W Hollywood at a special rate of $259 on the night of the dinner. This year's dinner will showcase some of the world's finest wines paired with a four-course dinner prepared by Innovative Dining Group. Several of LA's top sommeliers to oversee the dinner's wine service. The evening will conclude with a live auction featuring one-of-a-kind lots like a walk down the red carpet at a Hollywood premiere in a Randolph Duke couture gown; dinner with comedians Cheech and Chong; a progressive dinner for four couples in Los Angeles' top elite homes; a private movie screening; and a lot of 100-point Robert Parker rated wines from around the world. The Bogart Pediatric Cancer Research Program supports the Bogart Labs at Childrens Hospital Los Angeles. Named in memory of Neil Bogart, the late record and film executive who died of lymphoma at the age of 39, The Bogart Pediatric Cancer Research Program was founded in 1984. This January Bogart awarded a five-year $4.7 million grant to support the Childrens Center for Cancer and Blood Diseases (CCCBD) and the creation of the Bogart Leukemia Research Program at Childrens Hospital Los Angeles. Cheech & Chong and other celebs make appearances on Cypress Hill's latest album, Rise Up. Sen Dog tells the UK's Daily Record about working with Cheech & Chong. "They're such a big part of why there is a Cypress Hill. I used to think I was Cheech when I was 14. I used to dress like him and everything. Even knowing them is a trip, so actually working with them is overwhelming. They are becoming more normal as time goes by, but doing anything with those guys is an honour. Those guys are always cracking jokes. They are really funny to hang around with. I think they get enjoyment out of watching people laugh. They were constantly cracking jokes and people were laughing which was good for the environment." The album is in stores now. The best buds of comedy are back and funnier than ever! In their triumphant return 25 years in the making, Cheech & Chong embark on an all-new trip that will leave you rolling with laughter. “Cheech and Chong’s Hey Watch This” is a feature film showcasing the guys’ hugely successful reunion tour, Cheech & Chong: Light Up America, where they performed together for the first time in over 25 years. The pop culture duo performed for more than 100 audiences, grossing eight figures, making them one of the most sought after shows of 2008-2009. The film will be presented in select digital theatres on Friday 4/16, Saturday 4/17, and Tuesday 4/20. On the short list of comedy's all-time greatest duos, Cheech & Chong have been making people laugh until they cry (or puke) since breaking out in the seventies with immortal routines like "Basketball Jones." Twenty-five years later, and after releasing classic films like "Up in Smoke," Cheech and Chong, the legends, are back on-stage once again. “We had an amazing time last year reconnecting with each other and our fans in a way that felt like it was part of our DNA, we were meant to be together,” said Cheech Marin. “In 2010 we are looking forward to doing more classic material that people haven’t seen for years and years, performing more of our songs and introducing some new bits. We’ve had material brewing separately for the past 25 years,” said Tommy Chong. Successful beyond their wildest dreams, Richard “Cheech” Marin and Tommy Chong defined an era with their hilariously irreverent, satirical, counter-culture, no-holds-barred comedy routines. Together, they represent a lifestyle and are the originators of the “stoner film” as a genre. Their phenomenal success included nine hit comedy albums and eight hit films, breaking box office records, shattering comedy album sales, garnering multiple Grammy nominations and mesmerizing fans for more than a decade. 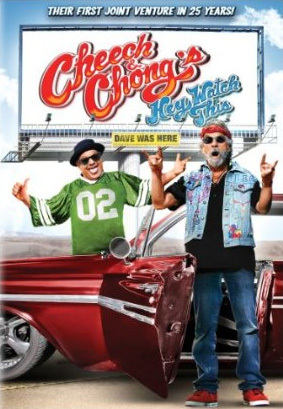 “Cheech & Chong’s Hey Watch This” is theatrically distributed and marketed by D&E Entertainment (www.DandEentertainment.com) in conjunction with The Weinstein Company and Vivendi Entertainment and will premiere for a special run in digital cinemas in cities throughout North America. Participating theatres include: ArcLight, UltraStar, Clearview, Wehrenberg, Muvico, Goodrich, Bow Tie, Celebration, Emagine, Trademark, Rave, Cinema West, Studio Movie Grill, Cleveland Cinemas, Rialto Cinemas, Monaco Pictures, Patriot Cinemas, Allen Theatres, Phoenix Cinemas, Central Cinema, Brattle, Senator Theatre, Michigan Theatre, Lark Theatre, Merrill Theatre, The Palace Theater, Regent Theatre, Red-Vic Theatre, Showplace East Cinemas, Tower Theatre, and Duke University Union.. The DVD, Blu-ray and available VOD all hit the street on 4/20 as part of a cohesive multi-platform marketing plan and celebration. “It’s an honor to be working with Cheech & Chong and selected by The Weinstein Company as their marketing and distribution partner. Now fans who have not had a chance to see Cheech & Chong’s great live show can do so at their local theatre with the best seat in the house. At D&E, we’re able to bring unique entertainment opportunities to our fantastic theatre partners, provide content creators with a quality theatrical campaign all while servicing consumers who are looking for more than the typical film fare at their local cinema.” stated Evan Saxon and Doug Kluthe of D&E Entertainment. The film has a running time of 90 minutes. More details on the extras on Cheech and Chong's live tour DVD/Blu-ray, Hey Watch This. The DVD and Blu-ray will be released April 20th (420!). Subtitles in Spanish and English. Here is video of Cheech Marin at the Los Angeles premiere of The Perfect Game. The film was supposed to be released a couple years ago, but kept getting delayed because the studio didn't think there was much demand for the film. Here's video of Cheech Marin at The Grove in California. It's where celebrities go to get coverage by the paparazzi. Love me world, love me. I can't wait to get more free stuff at my next charity golf tournie. Tickets for the Cheech & Chong: Get It Legal tour at the Dodge Theatre in Phoenix, Arizona went on sale today at 4PM local time. Click the Ticketmaster link above.